Once you’ve decided your kids need a special diet, it’s time to win them over! The first step to getting your kids on board is to get yourself on board. Note: One important aspect of preparing for a special diet is to get the adults in the family on the same page. In our case this didn’t mean just TinyHands and me – we also needed to involve the children’s dad, who we share parenting time with. While special diets can be carried out without everyone’s participation, it makes it much easier if all the adults agree on the basics. This topic is too big to deal with here, it’ll get it’s own post! If your child has received a diagnosis or is having major health problems, you’re probably going through a lot of feelings of your own. It’s normal to feel sad about the diagnosis, happy that there is something you can do about it, fearful it won’t work, angry about the changes you’ll have to make, guilty for not figuring it out sooner, and a million other things, all at once. Or you might feel one thing for a while and then suddenly switch, seemingly out of the blue. You and your children probably won’t be in the same emotional place a the same time. The more aware you are of these dynamics, and the more support you line up for yourself, the better prepared you will be to deal with them. Most people are influenced by the feelings of the people around them. Even people who don’t directly respond to other’s emotions react to the stress level that surrounds them. While it’s ok for your kids to know that sometimes you have negative feelings, this is not the moment to show them your negative emotions about the diet. The feelings you want to focus on projecting to your child are compassion, confidence, and hope. Your chidren’s ages, developmental stages, and personalities will make some differences in how to approach things. But from the youngest toddler to the most surly teen, there are ways to involve them in taking responsibility for their health. This rest of this post is about how to helping your children see the value in trying the diet. Figure out the non-negotiable details of the diet. Do your children need to avoid one food completely? Does everything eaten need to be tracked accurately? Does blood sugar need monitored? Are you trying to figure out intolerances with an elimination diet, or keep reactions low with a rotation diet? Are you trying a whole system for healing the gut, like GAPS, in hopes of getting relief for unexplained symptoms? I keep talking about empowering kids and giving them control, but that doesn’t mean you will be giving them the responsibility of making all their health decisions. Do not present the diet as optional unless it truly is. Do not overwhelm your children with the responsibility of bringing together all the information and deciding the right course of action. The less developmentally mature the children are, the fewer aspects of the diet will be decided by them. Once you have these things figured out, you’ll be in a position to discuss them with your children. If you can, find some age-appropriate books or videos that show other kids who successfully manage the same diet you are going to try. Also, look into whether there are support groups in your area. It’s nice for the kids if you have a few resources in your back pocket ready to go if and when the kids are ready for them. If you’ve fought over food with your children in the past, the first order of business is to make peace and get a fresh start. Your children aren’t going to make the first move. As parents, it’s up to us to take responsibility for any drama that’s happened in the past. That gives our kids the chance to feel things can be different in the future. Starting a special diet can be a great way to get past food-related power struggles. Regardless of the past, if you have a child who is capable of a conversation, get a fresh start with an open, honest discussion about their health issues and the diet. Even if your child is not communicative, you never know what they might grasp. At around age 3 our daughter started telling me stories about things that had happened before she could talk. Not being communicative didn’t mean she didn’t have a concept of what had happened! You don’t have to make the conversation long and drawn out, but it is important to show your children that you see them as a part of the process – this isn’t something you are doing to them, it’s something you are doing with them. At each stage of this conversation, your children may express strong emotions. Some kids will be articulate, while others may throw a fit or shut down. When that happens it’s time to listen, not to vent your own feelings. Let go of your agenda and express compassion. Compassion is different from pity. If your children express negative emotions, it’s helpful to show them that you understood and heard them, and that it’s ok to feel that way. It’s not so helpful to go to that negative place with them! That doesn’t mean you need to try and cheer them up, either. Just listen, and be kind to them in the moment. When things are back to normal, return to the conversation. It may take several days to get through it. Bring up the health concerns or other reasons for the diet in an emotionally neutral way. Some kids will already feel really awful and want to feel better. But some kids need to start a diet even though they feel fine! Explain the condition accurately, even if the facts are unpleasant. Even kids who are non-communicative can benefit from you explaining things to them and may be able to take some of the information in. Don’t turn it into a long lecture. Hopefully your child will be interested and engaged, and you can share information up to the point where they lose interest. Tell your children you will be changing the way they (or the family) eat, so that the health problem can be controlled. Express confidence that the new diet may be able to control the problem. Don’t promise a perfect cure, though. Be honest with your children both about the possibility that the diet won’t solve everything, and that you think it will be worthwhile to try it. Explain the details of the recommended diet. Again, be brief and as simple as possible, while staying accurate. Sharing accurate information with children shows that you trust them to handle the information and be a part of things. What do you think will be gross/hard/unpleasant about this diet? What symptoms would you most like to see fixed? What foods will we have to stop eating? What will we eat instead? What new foods do you think sound the best? How could this diet help you? What do we need to do to get ready for the diet? Who will be able to help us with the diet? How will we know if the diet is working? 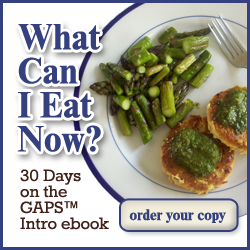 What might happen if we don’t follow (various aspects of) the diet? End by asserting that this might take a while to get used to, for everyone in the family, and expressing your confidence that your children will be better off for doing the diet. Notice that nowhere in here did we ask the children if they will do the diet or ask yes or no questions. The quickest way to a power struggle is to give them options you are not willing to accept them taking. Avoid that at all costs! Up next we’ll be talking about the practical side of things! Have you talked with your kids about their diet? How did it go? This post is part of Freaky Friday and Fight Back Friday, Simple Lives Thursday. A lot of this rings true in our house with our first grader, it has been a trying journey, to be sure. The hardest part is still the out and about and the peer pressure to be like everyone else around you. Her food looks normal, but when all the treats are brought in…that has been difficult. She is just now learning to except it with more grace. Her teacher sometimes forgets to grab her cupcake in the freezer, but she rolls with it and knows her teacher will bring it the next day. It is hard journey, one that has had many bumps for us, but consistency is HUGE! Thank you for taking the time to share on Allergy Free Wednesdays, many people could find helpful tips and insight from this post! Yeah, being “normal” is something our son thinks about a lot. It is the hardest part, I think. our daughter doesn’t seem to mind that aspect. Then again she’s never cared much about other people’s opinions. I’m glad you enjoyed the post. I’ll let you know when the next one is out!